Cube Décor is a unique and very popular home accent that gives you a way to display 5 images at a time! This product fits perfectly in any room and works great for all types of photography. One of our favorite uses for Cube Décor is at wedding receptions! 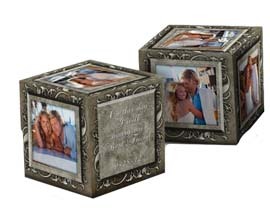 Stack the 4x4 cubes together and display all your favorite wedding photos for everyone to enjoy!